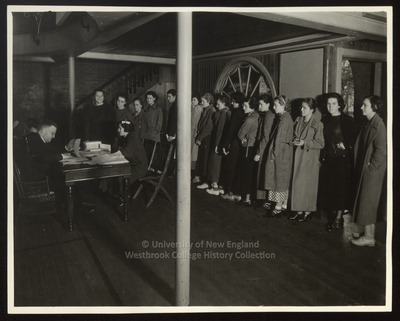 "Registration Day, Westbrook Junior College, 1930s"
Fifteen Westbrook Junior College students stand in line to register for their courses in this 1930s black & white photograph. A male Registrar, perusing a clipboard of papers, sits in a wicker chair at his desk. A student sits opposite in a double, wooden folding chair. The sixteen young women wear long coats and oxfords with bobby socks or cuban heeled shoes.